It’s the second instalment of the Hunger Games franchise and everyone from the first film is back. Everyone who wasn’t brutally murdered, that is. Emma Street enjoys the scenery and wonders where it’s all going to end. 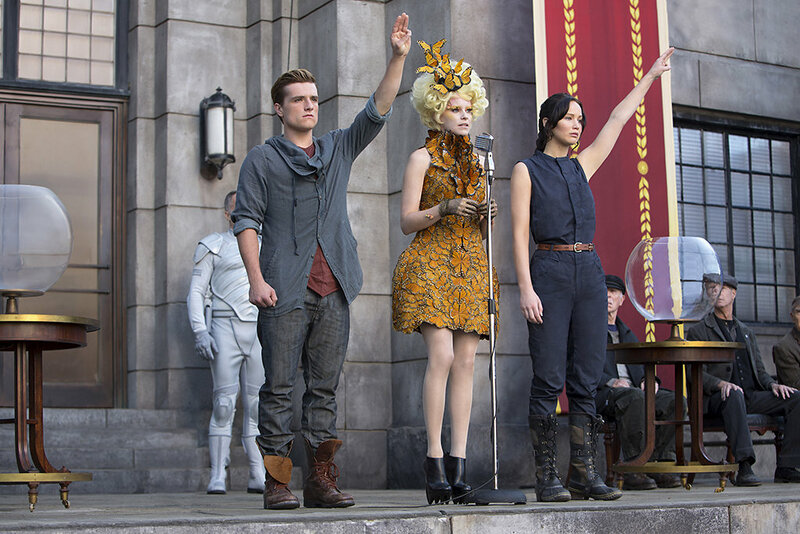 The Hunger Games: Catching Fire is out on general release tomorrow. At the end of the first film, the protagonists, Katniss and Peeta won the titular fun-filled murder extravaganza by a sneaky bit of rule-breaking and blackmail, enabling two people to survive the tournament for the first time ever. What, we wonder, will our plucky heroes do now? Anyone who has read the Suzanne Collins novels already will have a pretty good idea already. Both the first Hunger Games film, directed by Gary Ross, and this sequel (Francis Lawrence taking over directing duties) are pretty faithful to the books. I don’t think every successful book needs to be turned into a film. Although, that is exactly what happens anyway without my say so. Hollywood filmmakers are apparently willing make a film out of anything from a self-help book like He’s Just Not That Into You to a 300-word kids’ book like Where The Wild Things Are. A trilogy of popular sci-fi books for teenagers which spent over 100 weeks in the New York Times bestseller list was always going to be a no-brainer. The books contain a lot of descriptions of scenery and people running around the scenery, and Catching Fire is accordingly visually sumptuous. The scenery is the real star in this movie. There are plenty of big sweeping vistas, showing us the grey ghettoey drudge of Katiniss’s home, the sparkly, shiny fripperies of the capital city and the expansive terrain of the Games Arena itself. Jennifer Lawrence once again plays grumpy Katniss. As the first person narrator, in the books she keeps her true feelings hidden beneath an inscrutable mask. Katniss’s face is required to be a bit more scrutable for the screen. Luckily, Lawrence can do facial expression so that’s OK. Josh Hutcherson reprises his role as Peeta Mellark. There’s not a great deal for him to do with the role but Hutcherson (graduating from the likes of Bridge to Terabithia and Zathura) seems to be carving out a career for himself playing nice all-American boys. Yes, yes, but can you play the *Black* Swan? By the way, here’s a tip for any Fantasy/Sci-Fi writers out there, if you’re going to go to the trouble of thinking up a bunch of names which sound quite – but not totally – like real names, then don’t just take a normal name and spell it a bit weird. (Game of Thrones, I’m looking at you here, as well.) I don’t care how it looks on the page, what we’ve got is a character called Peter. You may as well have called him Geoff. Or Jeph. Philip Seymour Hoffman joins the cast as the new Gamesmaker, Plutarch Heavensbee, whose predecessor was summarily offed at the end of the last film. Hoffman gives a wonderful performance combining affability and chilly menace in one gouty-looking package. Along with the President, portrayed by Donald Sutherland, he ably represents the enormity of the sinister authorities which control the world in which Katniss and Peeta live. We’re never shown how the future Earth depicted in The Hunger Games got that way. Clearly something bad happened between now and then which has rendered the world sparsely inhabited and permanently tetchy. We know the USA survived but I don’t think we ever get an explanation as to what happened to the rest of the planet (although I’m sure I could find dozens of fansites devoted to the topic if I cared to look). The Hunger Games world is pretty tiny. There are only 12 districts in all and Katniss’s home district is small enough that the residents all seems to know one another, much like one of those small seaside towns which get torn apart by terrible crimes in British TV dramas. There’s certainly only one bakery for the entire district which must be fewer than even Broadchurch has. Maybe there’s less demand for buns when you live in a dystopian hellhole. The whole district is small enough that, in the first movie, all the kids eligible to take part in the Hunger Games could be contained in one pen where everyone was in easy running distance of the stage. Despite this, the authorities are quite cavalier with the lives of its citizens, killing them off through starvation, neglect and an enthusiastic programme of public executions. Oh, and hosting an annual sporting event in which eleven of its people will be publically murdered, of course. With such a small population, you’d think they’d be a bit more careful. It’s a wonder they’ve anybody left to oppress. And it turns out that the populace are becoming a bit fed up of the gleeful slaughter of their children, and the oppression and everything. There’s more than a whiff of rebellion in the air now that the proletariat have seen Katniss and Peeta take on the system and survive. The potential uprising is an interesting plot development which is frustratingly cut short when Katniss and Peeta are thrown back into the Games arena. As plot twists go, it’s particularly contrived and stupid. (I say ‘plot twist’ but as it’s included in the official trailer, I’ve decided it doesn’t count as a spoiler). Sure, it looks pretty, sure, there’s tidal waves and deadly fog and killer monkeys but it’s just another Hunger Games, you know? We’ve done this before. Let’s get back to the real action. So, will our heroes survive the whole messy business second time around? There are three books in the series so you might suppose that everything will get wrapped up in the next movie. You’d be wrong of course because that’s just not the way things work any more. The filmmakers are following the Harry Potter / Twilight model and electing to split the final book, Mockingjay, into two films in an attempt to keep the cash cow incessantly lactating. Where will this madness end? How do we know they’ll be able to bring themselves to stop at a fourth film? Maybe they’ll decide to split the second half of Mockingjay into two more parts so that the third and fourth quarters get a movie apiece. Maybe they’ll keep on splitting the final part into eights and then sixteenths, on and on until cinemas are screening homeopathic slivers of original plot spread out over a 2 hour movie some time in 2036. Is that the future we want to live in? Is it? I say we rebel now, citizens. Before it’s too late. I love your reviews. What I remember about the third book is that Katniss is asleep for most of the plotty parts of it, so the fourth film may have to be J-Law-lite. That probably lines up with her own ambitions but is going to be grim for us unless the young men work on their charisma. I don’t think every successful book needs to be turned into a film. Although, that is exactly what happens anyway without my say so. -remind me why you don’t write all the reviews on this site?